60 days money-back and 12-month worry-free Guarantee! Please feel free to contact us via e-mail regarding our products or service. Thanks a lot! MIDI cable length:6.5ft. in + 1 out MIDI interface, 16 MIDI input channels & 16 midi output channels. 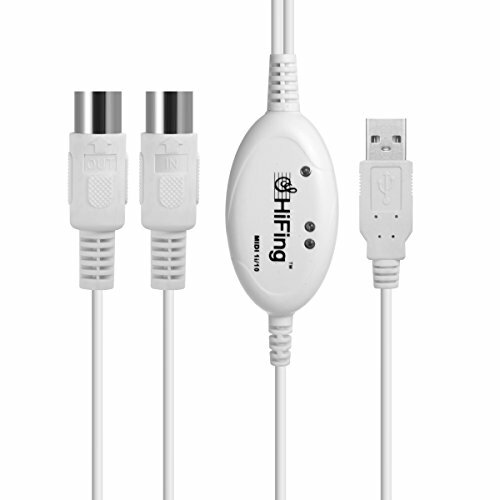 USB powered and class compliant for true plug & play. Just connect to a computer USB socket for automatic installation of the driver. LED's indicate power in, MIDI in signal and MIDI out signal. USB bus powered; Requires no external power. Compatible with Windows XP, Vista, Win 7, Win 8, Win 10 and Mac OS X operating systems. It's easy to turn your PC/Mac into a music studio, Start by connecting an electronic musical instrument to your computer with the supplied USB MIDI cable. Then you can play songs while they are being recorded on your computer. If you have any questions about this product by KangNa, contact us by completing and submitting the form below. If you are looking for a specif part number, please include it with your message.